Close to 40,000 students in Quebec launched a strike last week to protest against unpaid internships. It’s a topic that flares up in the news periodically, and draws out passion from many sides. 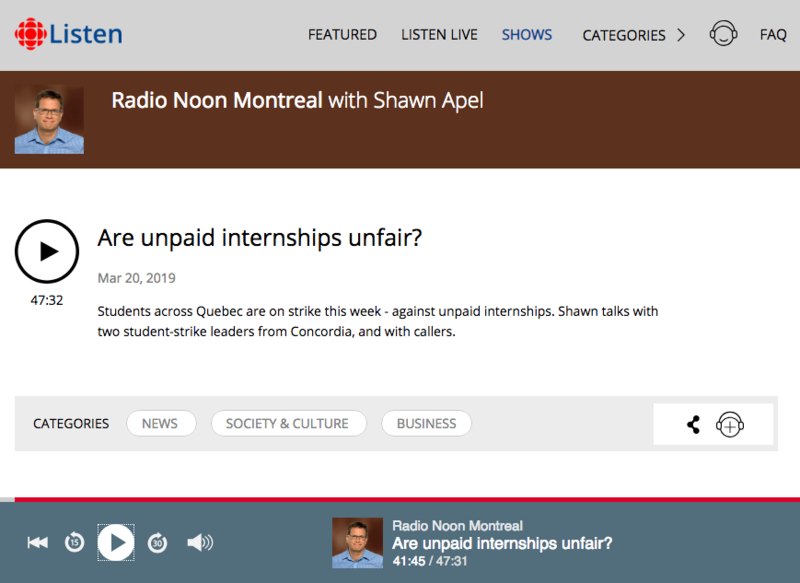 CBC Radio’s Shawn Apel in Montreal invited our very own Julie Labrie on his show recently to talk about whether unpaid internships are unfair. His show hosted very thoughtful discussions, interviewing student-strike leaders, and hiring managers from small businesses, non-profit organizations, among others, etc. Click on the image below to listen to the show. Shawn’s interview with Julie comes up at the 41:45 mark. “In an ideal setting, where an intern and company can negotiate an arrangement that is a win-win for both sides, where both parties can come in on an equal footing – I can see value for unpaid internships. That was my perspective a few years back,” said Julie. “The challenge however, as I mentioned back then, and one that I see continuing to grow today, is that some companies take advantage of interns as a means for unpaid administrative labour. I believe this is not ethical. As such, I do believe that today, we should do away with unpaid internships altogether. 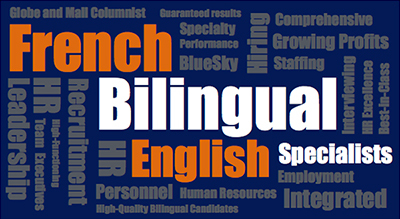 For employers who say that they have to invest a lot of time and effort into training interns (and therefore shouldn’t have to pay a salary on top of that), Julie points out that training is an ongoing part of onboarding any new employee, and in many senses is a business cost that cannot be avoided. At the end of the day, Julie says, if an intern is doing work that would otherwise be undertaken by an employee, then, that internship should be paid. What are your thoughts on this matter? Have you taken on interns at your company – paid or unpaid? Tag us on social media and share your thoughts. We’d love to hear from you!